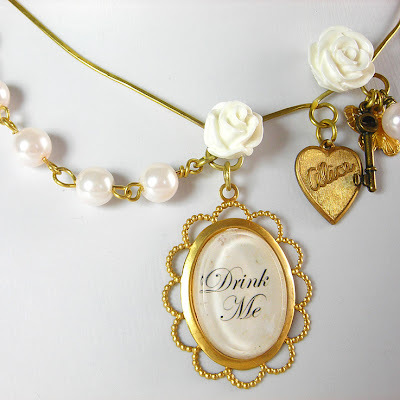 Newly listed Alice in wonderland Vintage inspired art necklace! This necklace is simply breathtaking! It is a real piece of art and took some time to make! Framed from hammered wire it features important elements from the Alice in wonderland story including a 'drink me' statement pendant, Brass 'Alice' charm and clock charm. 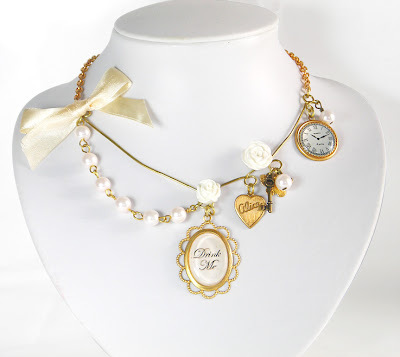 I've enhanced the design with creamy satin ribbon, cream rose flowers, key charm and glass pearls cascading along one side of the finished piece. I wanted to capture the wonderful imagination of the story and make this piece a real collectible. As always if you are interested in purchasing any of my work Click here for more information. Wow, these designs are always so nice.